Innovation is not without frustration. here are games that test your ingenuity by limiting your tools, but then there's Scribblenauts, which blows that box wide open and allows you to approach the problem with any solution your grey matter can conjure up. Or so they claim. Our scribblenaut in question goes by the name of Maxwell, and he has a very special ability. Using his notepad, he can type any word that can be found in a dictionary, and save for a few rules (i.e., nothing copyrighted, like a lightsaber) can make just about anything appear in the level. With whatever players have Maxell make, they must complete tasks in each level to earn Starites. These levels are divided into two categories: puzzle and action. Puzzles involve transporting cute, little fuzzy things while evading predatory animals or simply figuring out what someone wants based on an obscure clue. Action levels present various obstacle courses that Maxwell needs to traverse to find a Starite. entertaining your failures can be.For each type of level, there are ten areas, and within these areas there are usually about eleven levels to pass. Not every one is required, and with each level passed, players unlock a large number of them, which is great. Let's do the math, for the puzzles alone that is about 100 levels. Since most of them involve getting some adorable animal to safety, I would say there are really only four original puzzle levels. I don't feel that changing the scenery or type of animal to save constitutes a new challenge. The great stuff I have experienced typically involved something called "scribblenauts fights." A pirate wins over a ninja, mainly because the ninja couldn't throw his ninja star to save his life. But given a sword, the ninja beats the pirate — and rather quickly. I also enjoy some of the weirder objects in the Scribblenauts arsenal. For example, the fantastic Keyboard Cat or even the likeness of Rick Astley that appears when the word "Rickroll" is entered. Or how about summoning a necromancer with the Necronomicon? I certainly didn't expect that. I especially never expected some of my failures to be so entertaining. One puzzle level frustrated me early on; one where you must gather three flowers and give them to a lady. The first flower is guarded by an angry bee, the second floats in a piranha's home, and the third is up high on a cliff. I had the toughest time outsmarting the bee without murdering it. Just before I used a can of bug spray, I tried to find an animal to do the dirty work for me. What would eat a bee? Against my better judgment, and severe arachnophobia, I chose a spider. It killed the bee with great fervor, but what I didn't anticipate was that it would quickly turn on me. It was a milestone in DS-throwing for sure, but I feel my boyfriend was far more entertained by this reaction than I was with the entire game. I have two complaints. Controlling Maxwell should not be done with the stylus. Nearly every failure I experience (and that would happen nearly 95% of the time) results from trying to use an item I just created while the game interprets my stylus input as trying to move Maxwell. The scribblenaut is a bit of a klutz, as he tends to trip over things like suspension bridges that I just placed over some water, which then flip end-over-end and sink into the infinite abyss that is apparently only ten feet across. only four original puzzle levels.My other complaint has to do with Scribblenaut's physics. Every item you can make, regardless of size, lacks the realistic mass to give it any weight whatsoever. This threw a veritable wrench into most of my plans. I actually felt guilty for feeling upset about this — the best solution is to adapt, much like the astronauts on the moon, and forget about weighing anything down with items players would expect to be heavy, like boulders that are larger than people. No, these things just trail behind them like a piece of toilet paper stuck to their shoe. 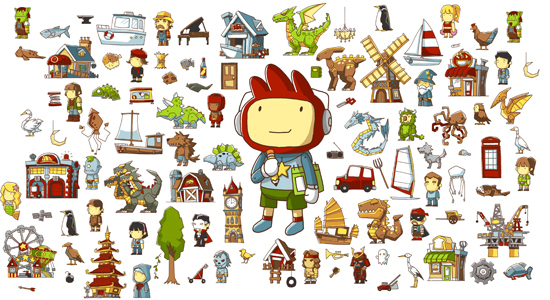 The ideas behind Scribblenauts are grand and fill the game with so many possibilities. But 5th Cell, like many other developers that find a great concept, don't seem to have anticipated how wild ideas affect gameplay. Either they were just too excited to notice or they hoped the gimmick is enough to carry the rest. I hope it was the former. Scribblenauts is just another great idea with mediocre implementation. I still may give this one a look, Jes. Even if 5th Cell had some issues with execution, Scribblenauts' concept is is one of the most ambitious I've ever heard of. Weren't those rooster hats? Either way, a chicken, a rooster and a hen all come out identical in Scribblenauts...lame! There are many things that use similar sprites, such as a nerd, scientist or Einstein. All the same! I think it's a good concept too... then again, good concepts have turned into garbage before. I'm disappointed because I wanted to play this, but based on your review it sounds like I'd get frustrated (I am a celebrated DS chucker myself) or annoyed by the details.